Butter (cream, water, salt), wheat flour, rolled oats, sugar, raisins, honey, glucose syrup (preservative (220)), dried sweetened cranberries (6%) [cranberries, sugar, vegetable oil], sunflower seeds, wheat bran, wheatgerm, raising agent (500, 541), flavour, food acid (330). Contains wheat, oats, milk, sulphites. Manufactured in a facility that uses egg, soya, peanuts, tree nuts & sesame seeds. 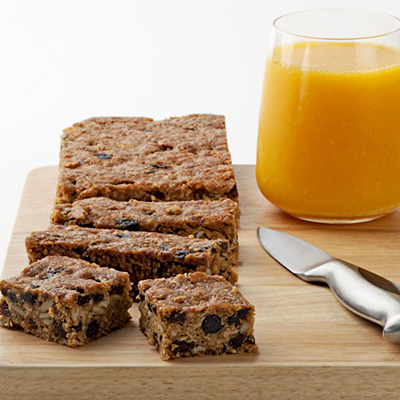 A sweet golden brown slice scattered with raisins and cranberries throughout a traditional muesli base made with the goodness of oats, sunflower seeds and honey. You can never go wrong with the great taste of honey and oats!